We are the Bennett family, missionaries sent from Southside Baptist Church of Rock Hill, South Carolina, and serving with Baptist International Missions, Inc., in the country of Brazil. God has blessed us with seven precious children. We are independent and fundamental, taking a conservative Baptist position. We use only the King James Version of the Bible in the English language. We have a very good translation of the Bible in the Portuguese language, using the Hebrew Masoretic and Greek Textus Receptus texts, translated by the Trinitarian Bible Society. Our first term in Brazil was spent in learning the Portuguese language, and also working with Dan’s brother, David Bennett, at the Bible Baptist Church in São Paulo. This church was started to reach the deaf of the city with the Gospel of Jesus Christ. While serving here, we also learned the Portuguese sign language which is completely different than American sign language. 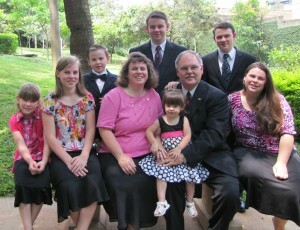 During our second term in Brazil, God led us to plant a church in Osasco, a suburb of the city of São Paulo. By God’s grace, we started the Igreja Batista da Bíblia (Bible Baptist Church) on October 1, 2004. We were able to turn this church over to a national pastor in October of 2011. We have now finished our third term in São Paulo, after having served in the Deaf church in which we ministered during our first term in Brazil. We are currently on furlough to report to our supporting churches, as well as visit some new churches in the United States in 2016. If your church does not support us already and is considering the possibility of taking on new missionaries, we would count it a privilege to meet you and to show you what God is doing in São Paulo. Take a closer look at our site. Read our testimonies and prayer letters. Get to know us, and hopefully we will have an opportunity to get to know you in the near future! Just a note to tell you that we have been praying for you for many years. Added your name to my list during a missions conference while in Alaska. God bless you and have a good day!